IN THE WOODS… is one of the oldest Black Metal bands out there, formed in 1991 in Norway, originally under the moniker of GREEN CARNATION. They release three full-lengths up until 1999, and then went into hibernation through 2016. 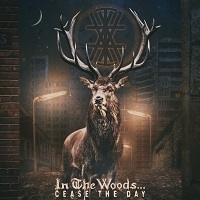 Evolving into a Progressive/Pagan Black Metal band, they now release their fifth album titled “Cease the Day,” which contains eight tracks. “Empty Streets” is a nine-minute opener. It opens with somber spoken words a slow, doomy guitar and key passage. The keys are laden with heavy vibrato, giving the music an old-school feeling. At about the half-way mark, it picks up with guitars and screams, and then returns to the somberness. “Substance Vortex” opens with depressing guitar notes and doomy, harmonized vocals thick with effects, leading to a long scream. Black Metal elements begin to pick up, but they don’t last long or take over the wonderful atmosphere created here with the keys. “Respect My Solitude” opens with an interchange between clean guitars and distorted guitars, and those ambient keyboards augment the harmonized clean vocals so well, creating a melancholy song of longing. “Cloud Seeder” opens with soft vocals and keys and a despondent sound, with just a hint of evil buried in there somewhere. Some Black Metal vocals come into play, but don’t overpower the solemnness of the track. “Still Yearning” opens with a lumbering riff that has sustain. The vocals are pensive and thoughtful. Black Metal elements come in hard, with double bass and a growling guitar. Then, it’s back to the peaceful but depressing sound again. “Strike up with the Dawn” opens with a clean guitar passage that leads to a main, slow and grinding riff. It progresses with some fierce vocals and hostile guitars, and an eerie lone riff that repeats itself. “Transcending Yesterdays” opens with a torturous scream and a dark riff. Through the chaos comes a solitary chorus that reverberates in your mind. “Cease the Day” is the perfect short closing prologue. Gentle voices can be heard overtop piano and flute, reminding you that it’s “time to seize the day.” This is an interesting take on Black Metal. They’ve been at it long enough to hone their sound and produce exactly what they want you to hear. The passages of pure Black Metal are raging, but they don’t overpower the more ambient and atmospheric ones, which are beautifully melancholy in scope. If you’re in the mood for a straight up somber album that lashes out from time to time, this one’s for you.